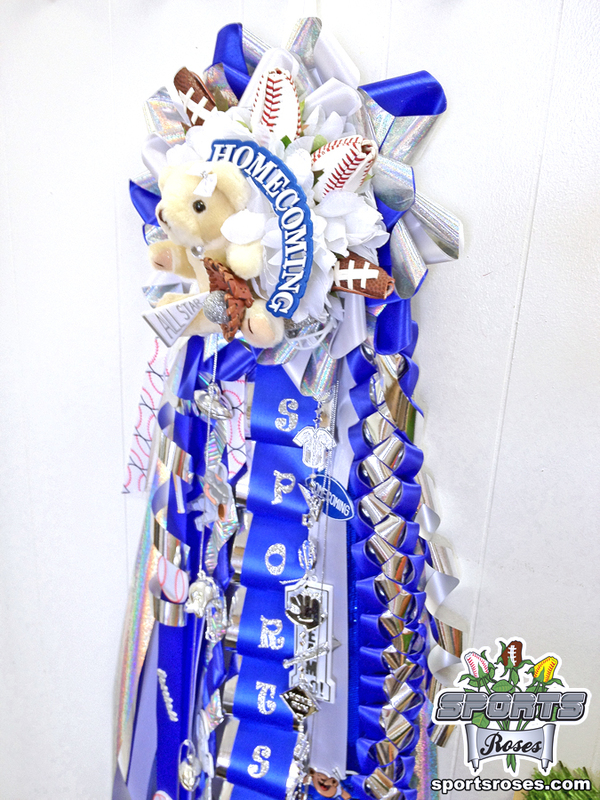 Sports Roses Homecoming Mum Ideas 3 « Sports Roses. Your passion for sports…expressed. Close up of Sports Roses Homecoming Mum featuring Baseball Roses and Football Roses. Ribbon chains used were texas diamond braid chain (left), loop chain (center), and military braid chain (right). The name “Sports Roses” was added to each loop on the ribbon. This is a Senior Mum version, so lots of metallic silver ribbon was used. Baseball and football trinkets, embellishments, and accessories were added to the ribbon.